ASECOS cabinets are designed and built to comply with BS EN 14470-1, and offer vastly superior protection over single or double wall steel cabinets to BS 476. These cabinets minimise the risks associated with storing flammable substances by protecting the contents for a tested length of time. Consideration has been given to the time required not only for personnel to leave the area in the case of a fire, but also to emergency services response times. Fire resistance is defined as the time taken for the temperature inside a cabinet to increase by 180K at any measured internal point. As a result, each cabinet is classified as Type 30 or Type 90. During the design process, all cabinets offered by ASECOS have been fully tested in accordance with BS EN 14770-1, and certified by an independent materials testing institute. 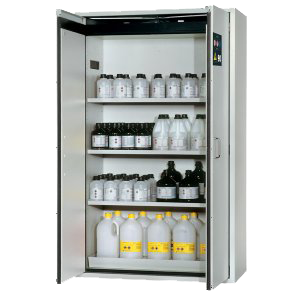 Safety storage cabinets with vertical drawers for unrestricted storage of flammable hazardous materials in working areas according to EN 14470-1, with a type-tested fire resistance of 90 minutes (Type 90). The V-LINE cabinets are available with one (45cm width) or two (81cm width) electromotor controlled vertical drawers, in the laboratory or industrial designs with various interior equipment to choose from. With a depth of 86cm, V-LINE cabinets use available space optimally and offer the same storage volume at half the width of standard cabinets. Innovative vertical drawer technology allows access to all stored containers on both sides. A standard automatic closing system, as well as electronic safety elements, ensure safety even in the event of a power failure. GS-tested safety storage cabinets for unrestricted storage of flammable hazardous materials in work areas in accordance with EN 14470-1, and TRGS 510 with a fire resistance of 90 (Type 90) or 30 (Type 30) minutes. All cabinets of the model group Q-CLASSIC-30/90 have been successfully tested in accordance with FM test standard 6050. Large variation of models – Q-LINE safety storage cabinets are available in three widths (60, 90, 120cm). Decades of development and optimisation ensure that the S-LINE safety storage cabinet is at the height of technical sophistication. 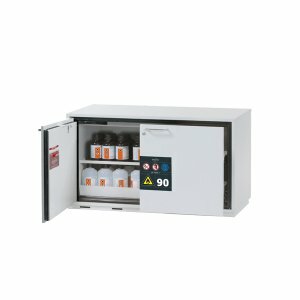 GS-tested safety storage cabinets for unrestricted storage of flammable hazardous materials in work areas in accordance with EN 14470-1 and TRGS 510, with a fire resistance of 90 (Type 90) or 30 (Type 30) minutes. 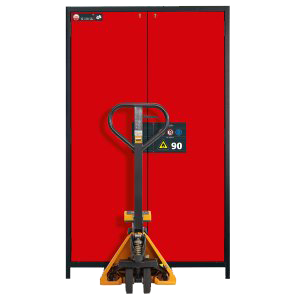 Large variation of models – The S-LINE safety storage cabinets are available in three widths (60, 90, 120cm), two heights (129 and 169cm) and partially in two depths. S-LINE cabinets are excellent products which come with a special manufacturer warranty of up to 5 years. GS-tested safety storage under-bench cabinets for unrestricted storage of flammable hazardous materials in work areas in accordance with EN 14470-1 and TRGS 510, with a fire resistance of 90 (Type 90) or 30 (Type 30) minutes. Large variation of models – Countless model variants in different widths, depths and heights, as well as with wing doors and/or drawers which allow adaption to user’s requirements and structural conditions. 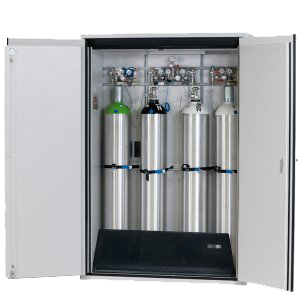 GS-tested safety storage cabinets for the storage of pressurised gas cylinders in working areas according to EN 14470-2 and TRGS 510. 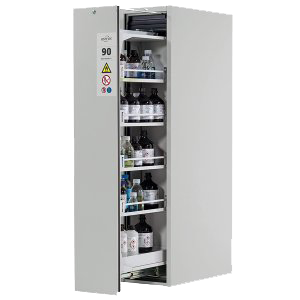 Maximum fire resistance – G-ULTIMATE-90 cabinets offer maximum safety when storing gas cylinders, with up to 90 minutes of fire resistance (Type G90). G-CLASSIC-30 gas cylinder cabinets feature proven technology and have a fire resistance of 30 minutes (Type G30). Unique on the market – Gas cylinder cabinet with a 60cm width for the storage of two 50 litre steel gas cylinders, or two 40 litre aluminium gas cylinders with a diameter of 230mm.